Q: How to secure my game? How do I get back my account if I change devices? Tap "Secure your game" in "Tasks". Q: I changed phone and my data is lost! I re-installed the game and my data is lost! 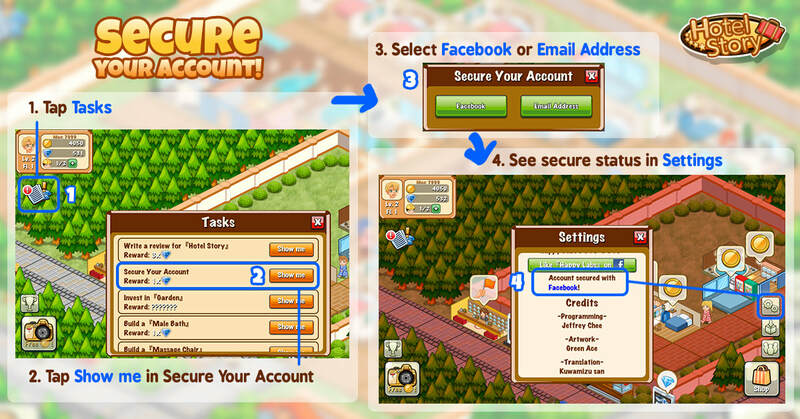 A: If you've secured your game with Email or Facebook, simply re-install and log in again with your credentials. If not, contact us at support@happylabsfree.com with your old Game ID and new Game ID and we’ll transfer your account for you ASAP. If you don’t have those IDs, please provide as much information as possible on your account, for example, device model, level, shop name, amount of diamonds, coins, etc. Any information you have will help. Q: How do I get the pink bedrooms/couple bedrooms? A: Keep on doing the “Invest in” tourist quests until the young couple appears. Go to your Quests, there is a diamond button at the top-left side, and you should be able to see “Invest in xxxx” quests sometimes. After you have unlocked the young couple, the bedroom that they stay in will turn pink. Q: How come there is a not connected sign on my building? What does the yellow sign with the red exclamation mark in it mean? A: It means the building is not connected by a walking path to the entrance of the hotel. A: Key in the ID of your friend in the friend window (search friend). Q: How come I cannot add any friends with their ID? A: The ID is case sensitive, Be careful of big i and small L, also 0 (zero) and big o.
Q: Is there any maximum number for Appeal? A: There is no maximum, but you should not go above 500. Q: How do I delete floors on Android? A: Select them first (hold on for a few seconds), then you can sell them – the initial floors cannot be sold now. Q: Where do I buy items? What are they used for? How can I use them? A: Items can be bought from the store just located outside the hotel. Items can be used to increase the Appeal/Price of the facilities. Tap on a facility (E.G, bedroom), then tap again on the “Info” icon. Tap on “Use Item”, to select an item of your choice to use. Q: How do I remove advertisements? A: Advertisements will be removed with any purchase of diamonds. Q: What is the purpose of increasing the facilities’ Appeal? A: The purpose of appeal on the buildings is to increase the animation speed of the tourists using the facilities. Q: What is the purpose of leveling up the tourists? A: Every time they level up, they can bring in more coins to spend, and also for every 5 levels, they can use 1 more facility before leaving the hotel. By default is only 3 times. Q: In my notification bar, it always says my workers are on idle and (I don’t know what is next) what should I do? A: It just means that you did not build any building or upgrade any buildings when you exit the game.